States that organisms are composed of cells, cells originate from other cells, and that the cell is the basic functional unit of life. The gel-like substance enclosed within both the cell membrane and the cell's organelles. Specialized sub-cellular structures that perform individual and critical functions within a cell. A type of cell that does not contain a nucleus or membrane-bound organelles. Its DNA is located in the cytoplasm of the cell. Compose only unicellular organisms. Cells that contain a nucleus and membrane-bound organelles. Compose either multicellular or unicellular organisms. A system of fibers and proteins that are responsible for the structure, organization, and motility of cells. 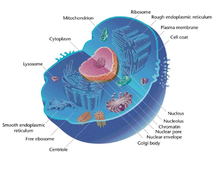 The largest organelle in a eukaryotic cell - it contains the genetic information (DNA) of the cell. A large, highly-folded organelle that is responsible for producing proteins and lipids, detoxifying the cell, and sending materials to the Golgi Apparatus. Small organelles responsible for the process of translation (turning RNA into Proteins by connecting amino acids together). Composed of rRNA and proteins. An organelle composed of membrane-bound sacs stacked on top of one another. Responsible for modifying, sorting, and delivering proteins. Short-lived, small membrane-bound vessels that transport materials around the cell. The organelles responsible for producing energy (ATP) in the cell through a series of complex chemical reactions. Have two separate membranes. A membrane-bound sac responsible for storing materials in the cell. Membrane-bound organelles that contain enzymes used to breakdown materials (including bacteria and viruses). Organelles made of microtubules that are used in flagella structure and may be important during cell division. Surrounds the cell membrane in plants, algae, fungi, and bacteria, but not animals. Provides additional structural support. Organelles that perform photosynthesis in all plant cells (and some other types of cells). Have their own ribosomes and DNA and share biological similarities to mitochondria.